While my mom was visiting this past week, she seemed to have a single mission: find wooden letter blocks for her grandson. Evidently, these were my favourite toys when I was his age. After visiting several toy stores in the city, the helpful owner of Pumpkins & Monkeys recommended we try The Teacher's Trunk on Louise Avenue and 8th Street in the Louis the 8th strip mall. 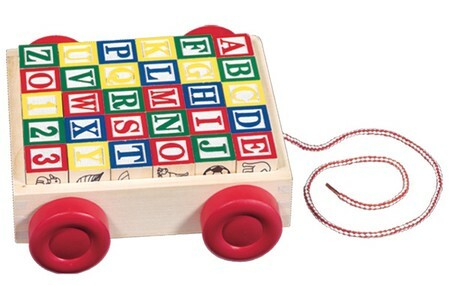 Sure enough, we found this great Melissa & Doug wooden wagon full of cute hand-crafted blocks, plus much more at The Teacher's Trunk! This little locally owned business not only offers a variety of teaching materials to enhance programming for grades Kindergarten to 12, but also fun and educational items for babies, toddlers and preschoolers. The Teacher's Trunk has affordable material that can be used for decorating rooms and play spaces, stickers and other incentives for potty training, puppets, books, activity workbooks, games and toys. The staff was helpful and extremely friendly to my mom, my 18-month-old and me. They said they often have parents come in to shop, and I can see why. If you haven't yet visited The Teacher's Trunk, I would certainly recommend it as an upcoming adventure for you and your little ones. There are also some wooden blocks available at The Better Good Store. They are also extremely helpful for homeschooling moms!